Get the best KRDO Network programming on-demand, 24/7, totally FREE! Bryan Bonner from the Rocky Mountain Paranormal Research Society has all the spooky details on some of their top investigations over the years. And, based on a true story. What big scary Hollywood hits are based on actual events? You might be surprised! El Paso County Clerk & Recorder, Chuck Broerman has the latest election numbers, and what you need to know for the upcoming election. Jennifer Pierceall Herman with the Pikes Peak Workforce Center highlights some upcoming hiring events and a few specific job openings. Dr. Julie Marmon from ER Specialist Urgency Center talks about Halloween and Health. Tips to help you and your family have a safe Halloween including information on glow sticks, costume contacts and much more. Justin pin-points the areas downtown that are either changing now or are soon to change. Justin says the downtown scene is back and the food scene is finally here! Kyle Hybl and Nicole Magic-Soto from the Police Foundation of Colorado Springs talks about the 33rd Annual Medal of Valor Luncheon, how the foundation supports the police department, and much more. Celebrating women owned businesses in October. Ted Robertson talks with Natalie McLaren, owner of Fast Fit Foods. She and her husband are high performing athletes and faced a challenge: eating well affordably. Computers are an essential part of our everyday lives. They break, get viruses or just wear out from age and use. Ted Robertson talks with Barry Biggs, the owner of PC Brokers. Greg Coopman talks with Ron Cornell with Prism Senior Solutions. Bell & Pollock explain attractive nuisance. In this edition of The Agent with Antonio Briceno, he’s calling out a big myth and busting it. You might have been told that the penalty for not having insurance is gone. Think again. Also, the Medicare open enrollment window for those of you 65 and older is going to snap shut December 7. If you need Medicare, need your plan reviewed, want to make changes to your Medicare parts A and B, you need to do it now. The insurance industry is pure chaos to most of us. With The Agent, you don’t have to do this alone. GOT QUESTIONS? Call (719) 203-6424. Antonio will answer the phone when you call and if he can't, please leave a message. He'll call you right back. SET YOUR APPOINTMENT TODAY: CLICK RIGHT HERE! The Agent with Antonio Briceno presented by Health Markets - Antonio Briceno airs Saturday mornings at 11:30 on KRDO Newsradio. Listen live at KRDO.com and on-demand at KRDO.com, select the Radio tab and click on Podcasts. Debbie has her good friend and college classmate, Gina Caughey, owner of A Call To Order, back to discuss how to prepare and sell your home. Listen and learn! Jay let's you, the listener, in on a new trend that is sweeping the nation in a show called "Scooters Gone Wild". See how technology is changing everything including the mortgage industry. Julianne gives you a good look at Moses and shows how God's love changed the Law as it was know in those times. Kristi Smith, U.S. Marine Veteran, UCCS Class of 2018 Graduate and Mt. Carmel Client. She is a former Marine & Colorado Army National Guardsman; experienced in applying personal networks to accomplish goals; driven to win-win solutions; just completed UCCS Communications Degree; skilled in American Sign Language; active job seeker; pursuing: Work with diverse groups, mentoring youth, achieving positive social change. Mt. Carmel helped her navigate a major career change; meet a variety of transition needs. Previously advertised everywhere, but *Happening Today – Saturday Oct 27* from 8 am-4 p.m at the Rocky Mountain Regional VA Medical Center, Denver: Same Day interviews at their ongoing job fair – 11 different career fields being recruited in medical and support areas. More info at: usajobs.gov Event is at 1700 North Wheeling Street in Aurora, Colo. – today – Oct 27 until 4 p.m. Led by national military recruiting firm, RecruitMilitary, event is open to anyone who has served on active duty, the National Guard, the Reserves and spouses. Fifty-two employers attending – all listed online at:http://recruitmilitary.com/ColoradoSprings. *Make sure you’re doing your job fair follow-up – professional thank-you’s, LinkedIn connections and emails after the job fair – Mt. Carmel can help show you how also! They Served, We Give Celebration on Nov 1: The community is invited to Celebrate & Honor Veterans at a reception at Mt. Carmel, Nov 1, 5-7 pm. Food, beverages, entertainment and silent auction. Bring your friends – we’re celebrating Veterans! Colo Springs Military Spouse Hiring Reception: Nov 6, 5-7 p.m. at Penrose House Conference Center - Networks & interact directly with HR experts & hiring managers from local & national companies; Get resume assistance & a LinkedIn photos! Pre-Register through the Hiring Our Heroes webpage – More details are on the Mt. Carmel FB, Instagram & Twitter. Mt. Carmel Peer Navigators networking event Nov 8, 5-7 pm - Specifically for Veterans, Military Spouses and transitioning military members! Expand your professional job search network and practice your elevator pitch with local employers, community partners and others. Free snacks and beverages at Red Leg Brewing Company, 4630 Forge Road. Trauma Informed Care Training Nov 15– In partnership with Griffith Centers, Mt. Carmel offers no-cost Trauma-informed Care training for those who have experienced trauma or have a loved one who has experienced trauma. Training helps to increase understanding regarding trauma, and how trauma impacts the brain and behaviors. Class is Nov 15, noon to 3 p.m. at Mt. Carmel. Call 772-7000 to reserve your spot. Excited to be part of Indy Gives 2018! Mt. Carmel Veterans Service provides career and transition assistance, behavioral health and wellness, supportive services, connection to community resources, and safe event space for veterans, military members and their families. Our non-profit has directly impacted more than 4,200 unique clients in the Pikes Peak region through more than 20,000 client visits since 2016. Please visit: indygive.com to learn more! Online: Veteranscenter.org – check out the calendar – events & services every day/every weekend for veterans, military & their families! In this edition of Business Week in review with Jeff Bonesprez, cyber, business, HR horror stories and terrible tales. Jeff and guests, Byron Thirsty McCurdy (can't find him), Don the Spawn Coffey (also mysteriously disappeared), Rob the Spleen Slee and maybe even Russ Corpusle Rogers. You don't want to miss this one! Jonathan Toman with Peak Radar talks about what is going on this weekend in the Pikes Peak region. Justin looks at the Millennial generation. Some are movers and shakers and some are losers! Listen as Justin breaks it down with hope on the horizon. Also Justin has some new listings he'll tell you about! Thrill the World is the single biggest synchronized dance event in the world! Thousands of like minded zombies gather to do Michael Jackson's Thriller dance all around the globe at exactly the same time. In this installment of The Finish Line, Randy and Sideshow are on about their glamping trip to Telluride; backed-up body shops; winterizing the little things like your RV and tires X 4! The Finish Line is presented by In & Out Auto Salon in partnreship with Johnny Martin's Car Central and sponsored by Mike Shaw Auto Group, American Battery and 365 Grand Club and Properties. TFL airs Wednesday evenings at 7:00 on KRDO Newsradio. Listen live at KRDO.com and get us on-demand at krdoewsradio.podbean.com! The issue of youth suicide has garnered a lot of attention and mobilized community action in recent years. However, the vast majority of suicides in El Paso County are middle-aged men. Susan Wheelan, Interim Director of El Paso County Public Health, and Dr. Leon Kelly, Deputy Chief Medical Examiner for the El Paso County Coroner’s Office, joined us on The Extra to talk about this and the Man Therapy Campaign. Morgan Mote, Executive Director of Colorado Springs Teen Court, talks about their upcoming Jewel of a Wine Tasting event at the Norris Penrose Event Center. The Medicare open enrollment period is here. If you're 65 or older, you don't have much longer have your current plan reviewed and to make adjustments or secure your coverage. Mike Lewis talks with Health Markets insurance broker and KRDO Newsradio program host, Antonio Briceno. Panel discussion on the Homelessness Action Plan with Colorado Springs City Council President, Richard Skorman. Homelessness Prevention & Response Coordinator, Andy Phelps. Capt. Erin Kauffman with The Salvation Army. And, Chief Development Officer from Springs Rescue Mission, Travis Williams. El Paso County Sheriff Bill Elder talks about two death investigation, illegal marijuana grows, and a lot more. It’s been almost a year since she was appointed to her position, and we have an update from Colorado State Director of Rural Development for the USDA, Sallie Clark, on her first year, biggest concerns for some Colorado communities, focus for 2019, and much more. CEO Diane Loschen and COO Sara Vaas from CONO talk about the organization, what they do, how they help area neighborhoods, working with local officials, and a lot more. Rachel Wright from the Cheyenne Mountain Zoo talks about Boo at the Zoo, the newly expanded haunted house, and more. Ted hosts Dr. Gary Moore, founder and owner of Star Dental Institute (proud sponsors of the Veteran's Voice Podcast with Mike Lewis), about a very special program he offers for those in our community who need teeth replacement. He and his team will replace your missing teeth at no charge, no obligation and without and strings attached. Ted Robertson talks with Real Deals owner, Robyn Rogers-Flak, about all things Real Deals, the fun items she stocks, classes and events. Bell & Pollock talk back to school carepool. Greg Coopman talks with Jim Ver Meer from Senior Living Decisions. The inaugural installment of The Agent with Antonio Briceno! Meet Antonio, learn what he's all about and most importanlty WHY he wants to help YOU with your insurance! Here's a clue: insurance is a total pain! You need a guy and that's Antonio, The Agent! GOT QUESTIONS? Call (719) 203-6424. Antonio will answer the phone when you call and if he can't leave a message. He'll call you right back. READY FOR AN APPOINTMENT? CLICK RIGHT HERE! The Agent with Antonio Briceno presented by HealthMarkets - Antonio Briceno airs Saturday mornings at 11:30 on KRDO Newsradio. Listen live at KRDO.com and on-demand at KRDO.com, select the Radio tab and click on Podcasts. Deborah has Chuck Dadisco from Drury Brothers Roofing in the studio this week. With the winter months ahead, it's time to have your roof inspected or is it? Deborah and Mr. Dadisco will walk you through how to prepare for the up coming months. Jay Garvens breaks it down with the Who, What, Where, When & Why of buying Real Estate. Are you ready to buy a home? This will help you decide. Stephanie Sierra's CONSUMER WATCH: Do you use Amazon or have an iPhone? If yes, this story impacts YOU and your CREDIT CARD. Featuring, KRDO's Business Week in Review host, Jeff Beauprez. Julianne Harris finishes up with Abraham, moves into Jacob, how he went against God's law and how God's love saved him. This week on Business Week in Review with Jeff Beauprez, of little chips and big problems; Jim Bearce from WalMart and Joe Parrino with T5 Data Centers, join Jeff to comment on that, local business and business continuity; Cyber podcaster, Chris Goreg, joins in as well. The Windows 10 update is STILL not ready for prime time; Business and Cyber Bytes and more! The KRDO Network is a proud sponsor of this year's Pikes Peak Studio Tour and we were privileged to host 3 of the artists on our Noon News program. Listen in as KRDO's Mike Lewis talks with Raquel Baiza, Susan Randolph and Eric Fetsch. 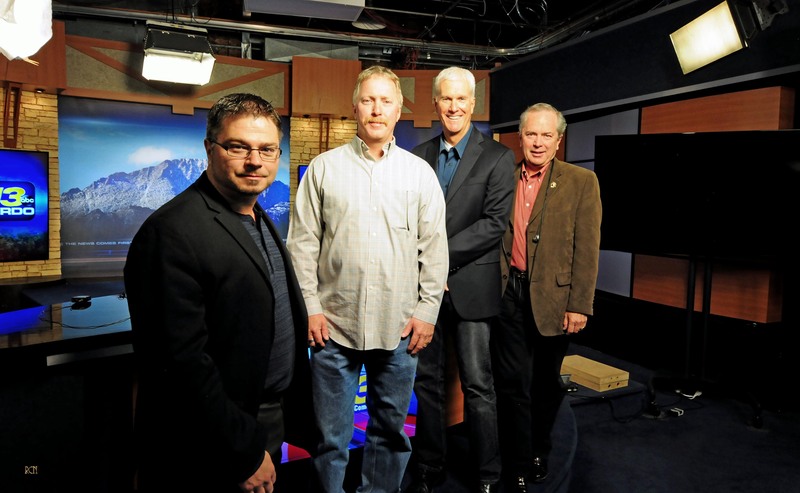 The KRDO Network is a proud sponsor of this year's Pikes Peak Studio Tour and we were privileged to host 3 of the artists on our Business Connection and Noon News programs. Listen in to the Business Connection as Ted Robertson talks with Raquel Baiza, Susan Randolph and Eric Fetsch. ***NEW*** Saturdays at 11:30 a.m.! "The Agent" with Antonio Briceno! The health and life insurance world is big and confusing. Everybody needs insurance, but, it's hard to get unless you gotta guy and that guy is Antonio Briceno, "The Agent"! Antonio is an independent, licensed insurance agent. He's contracted with HealthMarkets Insurance Agency. The information he gives you on "The Agent" is general in nature, it's educational and it's not legal advice but it will help get you covered. "The Agent" with Antonio Briceno airs Saturdays at 11:30 a.m. only on KRDO Newsradio. Listen live at KRDO.com and on-demand at KRDO.com, select the Radio tab and click on Podcasts. This time round it's Randy and Side Show and they're giving away a ltitle mad money along with a lot ofo car talk! The Finish Line is presented by In & Out Auto Salon in partnrship with Johnny Martin's Car Central and sponsored by Mike Shaw Auto Group, American Battery and 365 Grand Club and Properties. TFL airs Wednesday evenings at 7:00 on KRDO Newsradio. Listen live at KRDO.com and get us on-demand at krdoewsradio.podbean.com! Sam Cole with the Colorado Department of Transportation and Master Trooper David Conway from the Colorado State Patrol talks about traffic safety, the increase in fatalities in our area, upcoming enforcement and a lot more. Kevin Madsen, Deputy Director of the Office of Emergency Management for the City of Colorado Springs talks about being prepared for winter. What you need to do to be ready in your car and your home. Traci Marques, Jennifer-Piercall-Herman, and Becca Tonn from the Pikes Peak Workforce Center talk about the current state of the workforce and upcoming job fairs.